Personhood goes down in Colorado: Voters say no to Amendment 67. 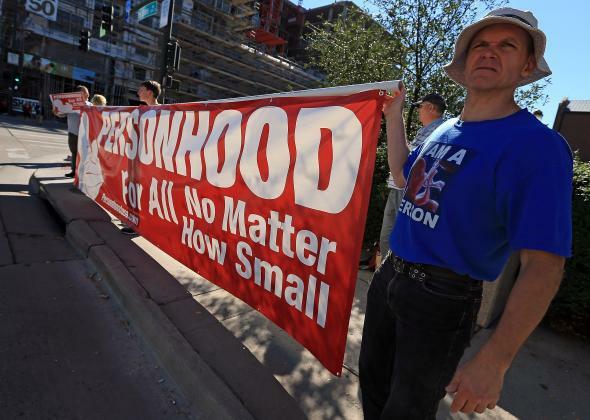 A Colorado man holds a sign in support of Personhood in 2012. For the third time, Colorado voters have been asked to vote for a “personhood” law, and for the third time, a resounding majority of voters declined. Proponents of Amendment 67, which defined a fertilized egg as a legal “person” from fertilization on, thought they could woo voters this time by narrowly wording the amendment so it would seems to only define fertilized eggs as persons for the purposes of prosecuting people who commit crimes against pregnant women. Supporters, such as Keith Mason of Personhood USA—which has backed more blatantly worded attempts to define fertilized eggs as persons in the past—even had a habit of taking umbrage at the idea that this law was an attack on women’s rights. Luckily, Colorado voters shot down personhood for a third time. Republican Senate candidate Cory Gardner, who supported previous efforts to define fertilized eggs as people, declined to do so this time around. Perhaps that’s what helped him eke out a win in Tuesday night’s heated race against incumbent Mark Udall. Now we’ll have to wait to see if anti-choice activists think fourth time’s the charm.